In the late 80s when I first returned to my Buenos Aires after having left it in 1967 I found that little had changed that was obvious. When I visited my half brother Enrique in his office in the financial district you could almost not see the sky because of the hundreds of phone cables. Buenos Aires was never as bad as San Paulo in those years. In San Paulo you had to have accounts with two phone companies in order to call from one phone number to another. Such was the “pulpo” (octopus) of phone lines that communications in BA in those late 80s was spotty at best. All changed with the advent of the cell phone. Now BA in March of 2017 has been liberated and the skies in the financial district are free of cables. Everybody had a cell phone. You see people glued to them in buses, trains, subtes and on the streets. There is a city ordinance in the works that will place low lying cameras in crosswalks to catch offenders. And yet my nephew Georgito O’Reilly regularly calls and receives calls from his very large extended family or from his boss inviting him to play golf on a weekend, while he drives on the many BA freeways. I have never seen Georgito use his turn signals. But he is not as bad as his son Jorge who once scared me almost to death when I caught him proudly punching a phone number in one hand while steering and driving with the other. I believe that Georgito has only been warned once on his car phone habit. Communications, as in instant ones, in BA are all done with texting. 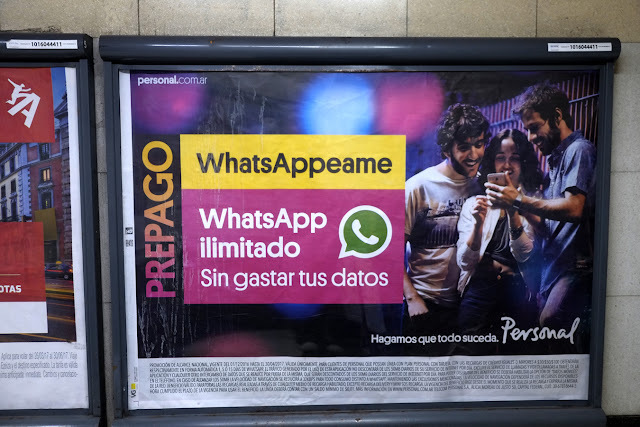 If you want to communicate with your friends and relatives in BA from Vancouver (or in BA when your phone is shut off for roaming (Telus is super expensive) then one resorts to WiFi and either Facebook Messenger or Whatsapp. It is much more effective than the now clunky, almost useless Skype. I attempted to use Skype today and I have been blocked by them until I upload the “improved” version. I have kissed them goodbye.